Ed Schlote, left, and his grandchildren Laney Miller, 7, and Jaxen Miller, 9, practiced at Hidden Valley Golf Course this month. Schlote is the event coordinator for the 42nd Little Brown Jug Junior Golf Classic. 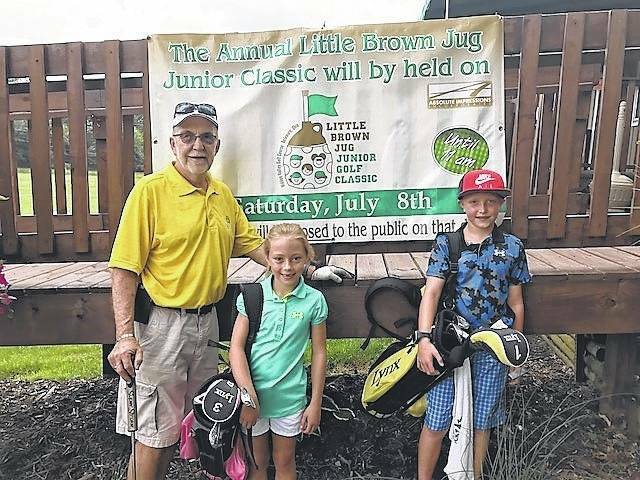 The 42nd Little Brown Jug Junior Golf Classic needs more youth golfers. Orgainzers of the tournament said it is scheduled for July 8 at the Hidden Valley Golf Course in Delaware. Registration is open to young linksters between the ages seven and 17. “We currently have 10 golfers registered and our hope is to attract at least 36 participants, which is enough to fill the course for one flight of play. We are able to accommodate up to 72 golfers,” said Ed Schlote, the event coordinator. “Registration has been slow this year and we are encouraging golfers to submit their registration,” he said. The Kiwanis Club of Delaware County, Noon Club, is the sponsor of the event, which returns after a one-year hiatus. Other sponsors are also welcome to support the local junior golfers. Individuals and businesses are welcome to support the event at any dollar level or by donating a prize. Hole sponsorships are available at $50 each. Registration forms are available at the city of Delaware and Kiwanis websites or by contacting Ed Schlote via email at eschlote@gmail.com. https://www.delgazette.com/wp-content/uploads/sites/40/2017/06/web1_IMG_1765-1-.jpgEd Schlote, left, and his grandchildren Laney Miller, 7, and Jaxen Miller, 9, practiced at Hidden Valley Golf Course this month. Schlote is the event coordinator for the 42nd Little Brown Jug Junior Golf Classic.